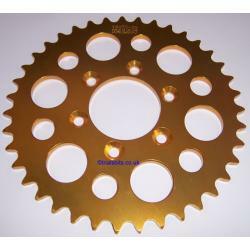 A Talon rear sprocket for the Yamaha TYZ 250, available with 39 or 43 teeth for a 520 chain. Please choose your preferred one from the dropdown box. Please note that the cut outs on the sprocket can and do vary, so the sprocket supplied may well differ from the image.